Seamless Liquid Waterproofing Roof systems have developed into excellent products for your roofs; these high performance coatings are strong, flexible and durable. The application process allows the systems to be applied to virtually any substrate, asphalt, felt, asbestos, steel or single layer membranes like Butynol. The big advantage of using a liquid system is the fact that it is totally seamless, fully bonded, extremely flexible and vapour permeable, thus allowing the substrate to breathe whilst ensuring a totally watertight roof. Being liquid applied seamless waterproofing makes detailing of complex shapes very easy as it will mould to any shape without any joints, laps or vulnerable seals. Health & Safety risks are also considerably reduced as it is applied cold and has a very high fire rating. It is very cost effective as, when it comes to the end of its service life, the GUARANTEE can be extended simply by applying a new top coat. It is also very environmentally friendly because it is applied over the existing structure, providing the substrate is sound, and therefore the old roof does not need to be disposed of at a landfill site. WHY SEAMLESS WATERPROOFING FOR YOUR PREMISES? On roof refurbishment projects, Liquid Applied Seamless Waterproofing systems present a cost effective way to provide your business with long term protection without having to remove the old roof substrates prior, saving you vital costs and without having the disruption to your business premises during works. Such solutions are ideal for commercial properties such as Schools, Hotels, Public Buildings, Industrial Premises and Retail Outlets. The process of liquid seamless waterproofing makes a new or existing roof waterproof. It can deliver up to 15 years performance depending on the coating system employed. It is estimated that liquid roofing is 70% less expensive than overall roof replacement in refurbishment situations. Projects with difficult access, restrictive clearances, multiple odd-shaped penetrations from plant equipment can prove problematic for roofing membrane systems such as single ply or torch on, in such cases a cold applied liquid option is a smarter, safer alternative. Plus there’s no compromise on performance as our Liquid Waterproofing Systems come with guarantees covering product and workmanship for up to 15 years. By choosing a cold applied liquid seamless waterproofing solution for your roof means that the installation is much safer than traditional roofing systems as no naked flame is required throughout the works. Roof coatings are an affordable and efficient way to repair, restore, and maintain your current roof system. The most popular roof coating, and the one we recommend the most, is an Elastomeric Roof Coating. This coating is applied as a liquid and dries to become a seamless membrane, making it tougher for water to infiltrate the system considering there are no seams for water to travel through. Coatings, when applied per manufacturer’s specifications, can extend the life of your existing roof for up to 15 years or more. 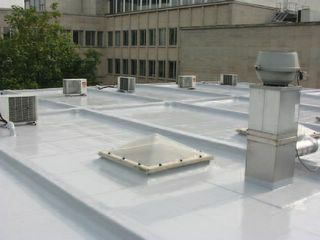 Waterproof roof coatings provide a watertight seal for commercial and industrial roofs. The best waterproof roof coating will also prevent future roof leaks, protect your roof from further attacks of weathering, and go on easily for best roof waterproofing results. Today’s superior waterproof roof coatings are now designed as “elastomeric roof coatings”. These water resistant coatings can weather more needs and changing conditions. Elastomeric refers broadly to a coating’s elastic properties – meaning being able to stretch and then to resume to its original shape. Yet elastomeric properties vary widely, often forcing a choice between critical features. But what if this wasn’t necessary? The extent to which a product stretches, its tensile strength, ability to resist moisture, adhesive factors and weathering resistance all impact how well a roof coating will perform. Even durability after ageing varies greatly among products. WHAT ARE THE BENEFITS OF A ROOF WATERPROOFING SYSTEM? • A seamless, waterproof new shield to further deflect weather, UV and extend the life of your roof. Exterior waterproof deck coating systems are ideal to protect occupied areas from water damage. Deck coating systems typically can be applied over concrete, exterior-grade plywood, balconies with a skid resistant texture for pedestrian foot safety. ROOFING & WATERPROOFING LTD For reliable service and professional quality workmanship you can trust, Please feel free to contact us today, we have the solution to all your needs and are dedicated to providing you with premium quality service for every project.